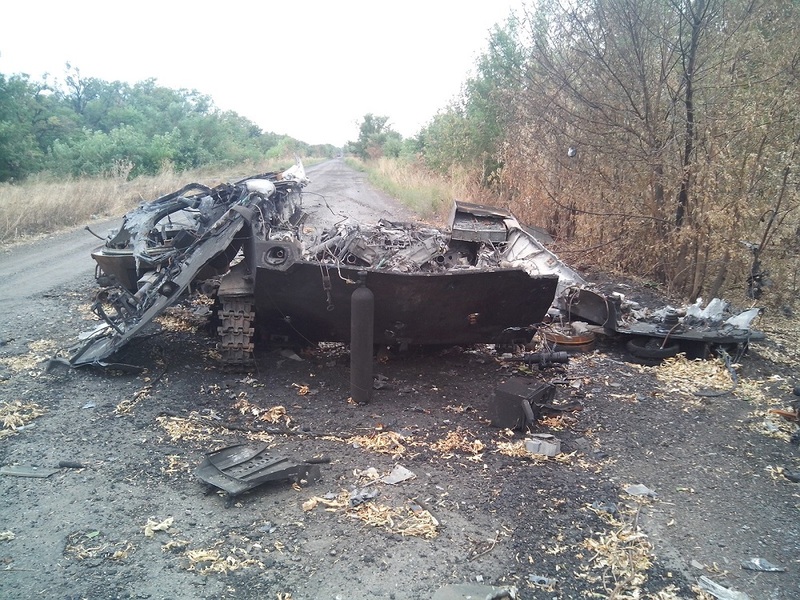 Throughout the first year of the conflict in Eastern Ukraine, the BMD family of armored fighting vehicles would remain ubiquitous on both sides — and suffered heavy losses along with their crews because of their thin armor. One remarkable aspect of that tragic war is the extent to which it occurred on social media — not only as a vigorous propaganda war full of falsehoods, but also on a very personal level as combatants from both side uploaded pictures, videos and written narratives of their victories and defeats. Soldiers sometimes learned of the fate of their comrades by perusing photos posted by the enemy on Facebook, LiveJournal and VK. On one occasion, a Ukrainian tank commander even posted a Facebook message to the mother of a Russian tanker whose life he had spared after knocking out his tank. Thanks to eyewitness accounts of Ukrainian army and separatist soldiers, research on Russian-language blog One Paratrooper and by the Ukrainian military writer Mikhail Zhirukov, combat video footage posted online, and painstakingly geo-tagged photo data collected at the website Lost Armor, we can see the role played by the light vehicles, the extent of the losses suffered by both sides, and the terrifying experience of operating one in combat. One of the first Ukrainian army units to respond to the uprising was the 25th Separate Airborne Brigade. The 25th maintained a higher state of readiness and training than the majority of the then-sclerotic and unprepared Ukrainian military. The unit was formerly part of the Soviet 98th Guards Airborne Division, and had inherited many BMDs — a Soviet-era armored fighting vehicle designed to air-drop from the sky along with paratroopers. A 2002 table of equipment lists the following BMD and BMD-type vehicles in the Ukrainian army’s possession. + 67 BMD-1s, equipped with short-range 73-millimeter low-pressure guns. + 76 BMD-2s, with superior 30-millimeter autocannons. 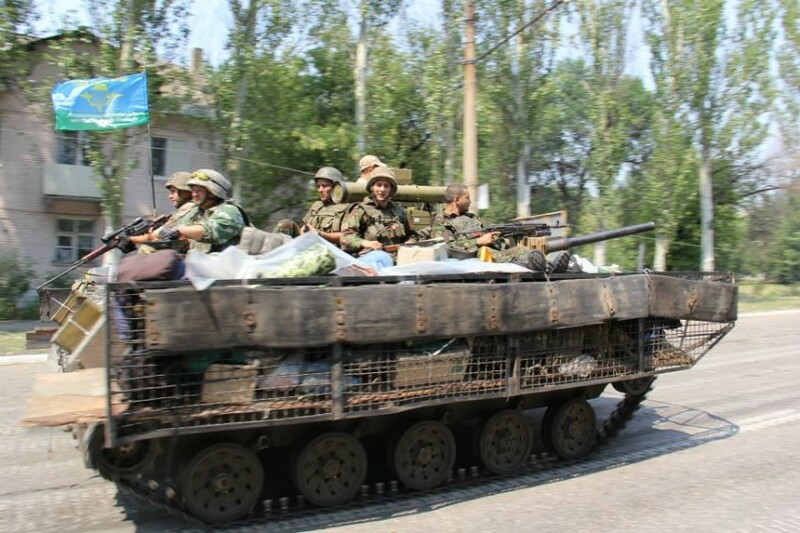 + 43 BTR-Ds, a troop transport model, some armed with anti-tank missiles. + 66 2S9s self-propelled 120-millimeter gun-mortars. Zhirukov claims that in early 2014, the 25th Brigade disposed of 50 BMD-1s — including 14 BMD-1KSh command variants — and 39 BTR-D troop carriers, but he does not give figures for BMD-2s. Indeed, a reconnaissance company of BMD-2s had peacefully extricated itself from the Crimean peninsula during the Russian invasion after negotiating with a Russian commander. Things didn’t go as smoothly on April 16, 2014 when Ukrainian BMDs and BTR-Ds ran into a separatist checkpoint at Kramatorsk. Civilians swamped many of the vehicles, forcing them to halt to avoid injuring the crowd. One tanker claimed a woman placed a baby on his treads to prevent him from moving forward. Other vehicles were boxed in by railway cars. 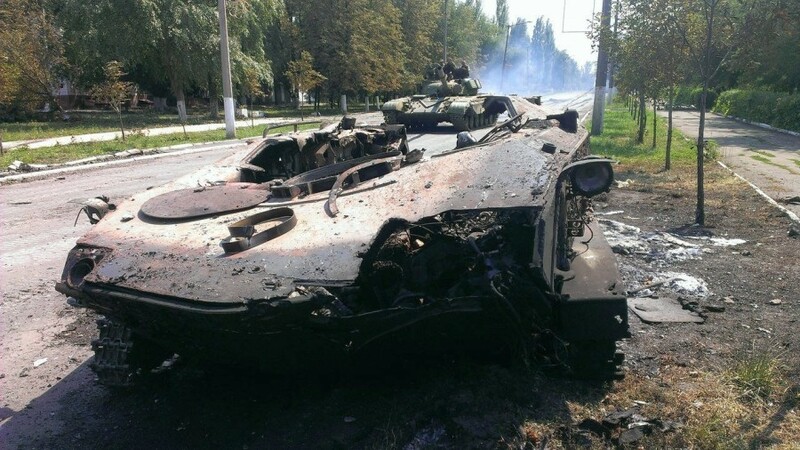 Although some of the paratroopers managed to extricate themselves, six vehicles were seized and impressed into separatist service, including a BMD-1, a BMD-2, a 2S9 and three BTR-Ds. The separatists captured several Ukrainian personnel during the scuffle, and at least nine soldiers from Eastern Ukraine defected to the separatist cause. The following day, Ukraine’s then-acting Pres. Alexander Turchinov ordered the 25th Airborne Brigade to be disbanded for “cowardice” — but quickly rescinded the border because the 25th was one of the few combat units able to act at all under the circumstances. You can see a video of a knocked out BMD-2 at Kramatorsk below. By some accounts, these were the first armored vehicles lost by the Ukrainian army in a conflict that would eventually claim hundreds. In the following days, violent clashes and ambushes multiplied. Ukrainian 2S9 Nonas, a self-propelled mortar variant of the BMD, thumped 120-millimeter mortar shells into rebel positions, becoming some of the first artillery to see action in the conflict. All of these vehicles dated back to the 1980s or earlier, and many broke down while deploying to the combat zone. Lack of spare parts and skilled mechanics familiar with the aging vehicles compounded the problem. Nevertheless, for two months, the 25th was able to deploy both men and BMDs directly to besieged government-held airports in Donetsk and Luhansk using huge Il-76MD transport jets carrying 40 men and three BMDs each as a “standard” load. However, the Ukrainian air force abandoned this method after a rebel Igla surface-to-air missile shot down an Il-76 on June 14, killing nine flight crew and 40 paratroopers. The melted remnants of three BMD-2 fighting vehicles on board were also photographed by rebels. The cramped BMDs had such small troop compartments — and the top-mounted hatches were so difficult and dangerous to use during combat — that many crew didn’t even bother carrying infantry inside, instead using the passenger compartment to store gear and food. To compound the problems, as temperatures skyrocketed during the hot Ukrainian summer, the BMDs’ internal compartments grew intolerably hot. Many photos therefore show infantry riding on top of the vehicles. Riding a BMD could be risky. That May, a paratrooper unit spearheaded by BMDs ran into an ambush while approaching Yampol. The rebels fired at them with 82-millimeter mortars and an SPG-9 recoilless rifle. At least nine Ukrainian soldiers lost their lives in the engagement and several BMDs were knocked out, in exchange for around four separatist casualties. The BMD’s thin armor can deflect projectiles up to 12.7 millimeters in size from the front, and only rifle bullets from the side. Worse, the ammunition and fuel supply are easily set ablaze. During the fighting, this vulnerability frequently caused the lightweight aluminum hulls to literally melt down to skeletons. While the BMDs have onboard fire extinguishing systems, their combat performance is poor. Ukrainian army crews soon devised additional defensive measures to increase their vehicles’ protection against rocket-propelled grenades, mines and recoilless rifles, all of which were in widespread use by both sides. One measure adopted by government forces was to install hand-made cage armor that triggered an RPG’s shaped charge before impacting the vehicle’s hull. You can see the cage armor in action in the video below as a 25th Airborne Brigade BMD-1 attempted to provide covering fire for a friendly BMP damaged in a rebel ambush near Uglegorsk. The BMD crew engaged rebel infantry with PKT machine guns and their outdated 73-millimeter low-pressure gun before taking a powerful hit, captured around 4:00 in the video. Afterwards, they inspected the vehicle, revealing that rounds punctured the side hull and tore one of the rear side skirts. However, the add-on cage armor appeared to successfully detonate an incoming RPG before it could strike the vehicle directly. The crew had decorated their vehicle with children’s drawings, many of which were blown off in the firefight. BMD crews also stuffed the cavities in their vehicle armor with bundles of wood, earth, sand and wooden boxes to absorb the blasts of incoming shaped-charge projectiles. At least one BMD-1 crew of the 25th Airborne Brigade even inserted long wooden logs in between their vehicle’s side skirts. 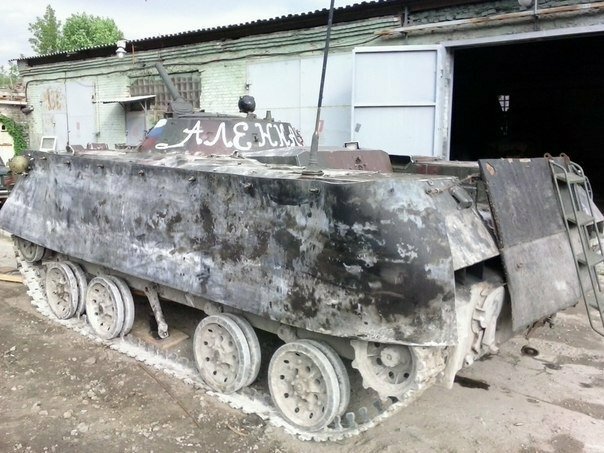 Pro-Russian separatists tried installing their own metal side-skirts on a captured BMD-1s [#833, below], but these did not save the vehicle from destruction in combat. He had at his disposal some of the BMDs captured at Kramatorsk, as well as a few T-64 tanks and BMP infantry fighting vehicles. You can see one of the rebel BMD-2s, flying a separatist flag, in action in Slavyansk in May 2014 in the video below. The rebel vehicles each received their own nicknames, such as “Ghost,” “Legion” and “Bastion,” as well as fanciful paint jobs. One BMD-2 was adorned with spotted leopard camouflage, a red star and a shark mouth. Both the Ukrainian army and rebels tried installing additional weapons on their BMDs. A common addition was a 30-millimeter automatic grenade launcher on the roof. One BTR-D troop carrier, #709, had a twin-barrel ZU-23 anti-aircraft cannon installed instead. Another BTR-D had both a grenade launcher and a 73-millimeter SPG-9 recoilless rifle strapped onto the roof, the latter weapon similar to the main armament of the BMD-1. The crew would’ve had to expose themselves to enemy fire to operate the weapon, a lesser risk if attacking targets at long range. On the evening of July 4-5, Strelkov’s troops attempted to break out from Slavyansk. Spearheading the retreat was an armored column of captured vehicles, consisting of two T-64 tanks, two BMD-2s and two BMP-2s. Standing in their path was Checkpoint #5, manned by a single Ukrainian airborne platoon equipped with four BMD-2s, reinforced by a few squads of local police. Earlier at 11:00 p.m. that evening, the platoon had disabled a car attempting to flee the city, capturing three women and a man who confessed that an attack was imminent. An hour later, the rebel tanks opened fire, killing one paratrooper and damaging a BMD-2. In response, a Ukrainian BMD raked the T-64 with 30-millimeter cannon fire — though the weapon had no chance of penetrating the tank’s thick armored hide. However, this reportedly so disoriented the tank crew that a policeman managed to crawl within 100 meters of the beast, blowing it up with an RPG-26 light anti-tank rocket. The other T-64 fled the battlefield and was later abandoned. A separatist BMP and BMD then attempted to storm the road block — the former was destroyed by a mine, the latter by an RPG shot from the commander of the airborne platoon. Only one rebel BMD-2 made it through the cordon, but was destroyed shortly afterwards. Following the disastrous operation, Strelkov was removed from command and sent back to Russia, where he now leads a neo-imperialist political party. Following the rebel defeat Slovyansk, the Ukrainian army seemed poised to crush the rebellion. 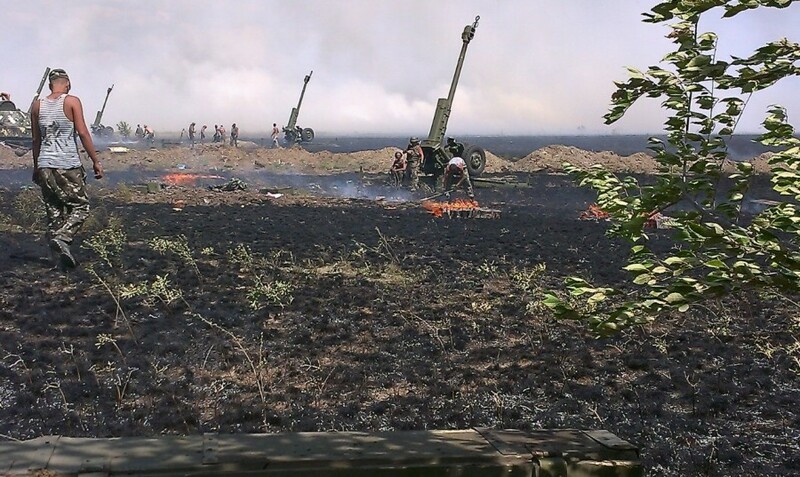 The 25th went on the offensive in the area around Shaktarsk — a community close to the Russian border — on July 26. The 24th deployed two companies equipped with BMD-2s, a platoon each of BTR-RD anti-tank vehicles and ZU-23 anti-aircraft trucks, and batteries of 2S9 self-propelled mortars and 122-millimeter D30 howitzers. Hellish fighting broke out as the paratroopers engaged a rebel force which included four T-64 tanks, several BMPs, and heavy artillery support including 82- and 120-millimeter mortars, D30 howitzers and Grad rocket launchers. 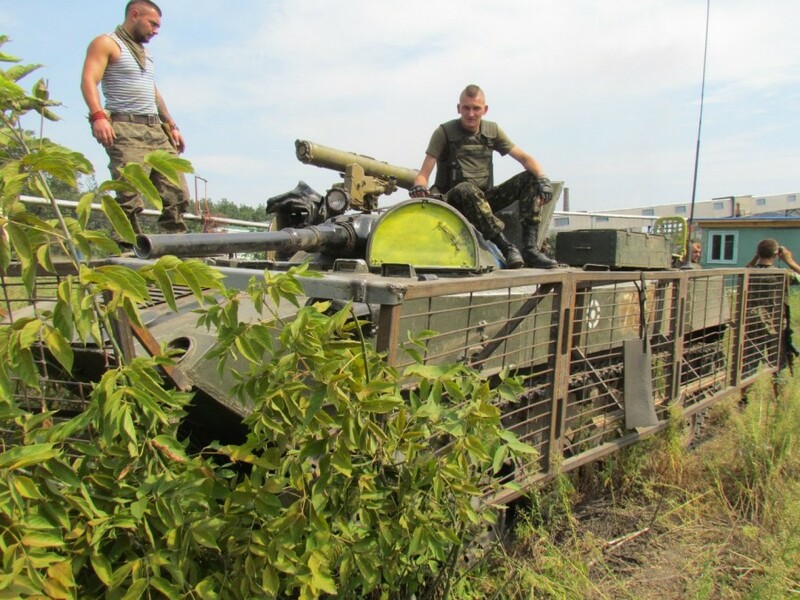 Many vehicles fell afoul of the hot and dry Ukrainian summer, according to a Ukrainian paratrooper driving a 2S9 Nona into combat near Shaktarsk. “Fires started in the 1st Battalion [25th Brigade] sector, and spread over to nearby houses. This is exactly how our Nona [2S9 self propelled mortar] battery burned down, it was simply enveloped by the flames of houses that were ablaze nearby. At first, ammunition that was littered nearby blew up, then the “Nonas” exploded. The soldier did not suffer in this episode. Just one more BMD was destroyed, which had not managed to drive away because the mechanic had been wounded. A pro-Russian fighter using the pseudonym Chervonets Andruykha describes on his LiveJournal page a deadly assault by BMDs on July 31, using the pejorative Russian slang “ukrop” — literally “dill” — to refer to the Ukrainian forces. UKROP is also the acronym of a Ukrainian nationalist party. Chervonet’s reluctant and untrained “reserve company” was ordered to dig into open ground outside Shaktarsk with assistance of civilian-manned tractors. Alongside his unit were Berkut, members of a special police unit disbanded by the new government in Kiev after the fall of Yanukovych, many of whom went on to fight for the rebels. “The first firefight in the village played out in this fashion: first, the Ukrop vehicles hosed down our buildings with fire. When someone shot in response from somewhere in the house, the Ukrainian tanks hit them. In reply, long distance covering fire (about 1,000 meters approximately) was provided by our two SPG-9 recoilless rifles standing in a conspicuous place. [The crew had only learned the previous day how to fire the weapon.] They began to pour large-caliber shells directly on our position. Then we hid and lay low. The Ukrainian light armor and artillery beat back a counter-attack by the Berkut, killing one, and chased the separatist fighters into the village and back out again, leading the remaining separatist militia to flee for the hills. An allied separatist platoon, issued a faulty map, blundered into the path of the Ukrainian armor and suffered losses. Subsequently, a Ukrainian armored column of the 3rd Company under Capt. Kazak attempted to break out of the village — but had the misfortune of encountering a rebel tank as they advanced. The first shell destroyed a BTR-D troop carrier at the head of the column. The rebel fighter describes what happened next. A second BMD spun its treads off its roller trying to back away from the tank and also had to be abandoned. The 3rd Company retreated, leaving three vehicles — two of them largely intact. 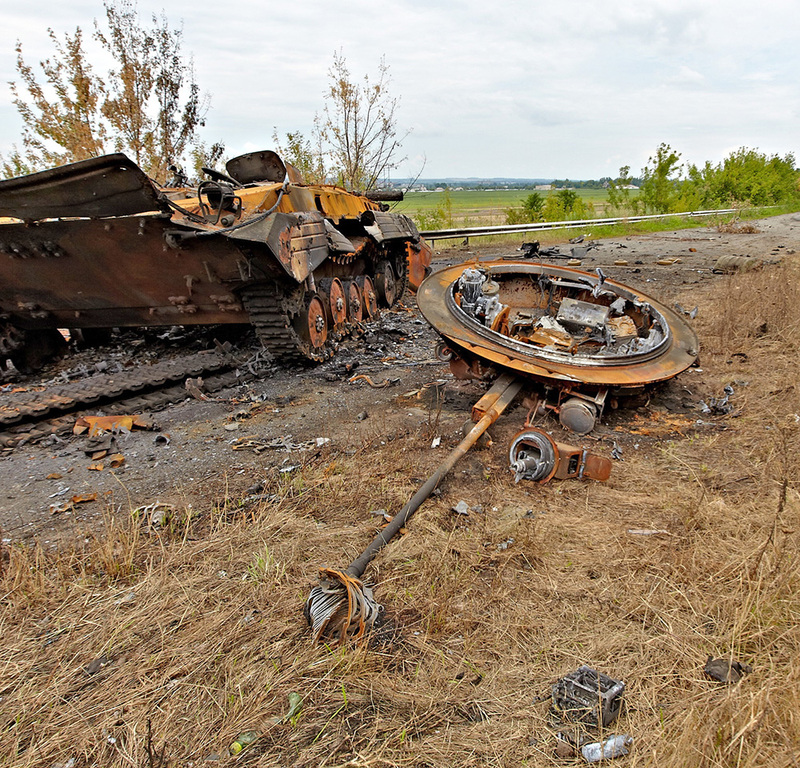 Separatists posted photos and a video of the mangled remains of the passengers on the BTR-D, which was how some of the 25th Airborne Brigade learned of the fate of their comrades. But the victory had proven costly for the unprepared rebels as well. In early August, columns of tanks and armored vehicles crewed by Russian army “volunteers” began pouring over the border, sending Ukrainian forces reeling. In addition to numerous T-72 tanks and heavy artillery vehicles, the rebels were reinforced by at least a dozen new BMD-2s, nine 2S9 artillery vehicles and a lone 1B119 Rheostat artillery observation vehicle. Some of the crews were part of Cossack mercenary companies with combat experience in Chechnya. 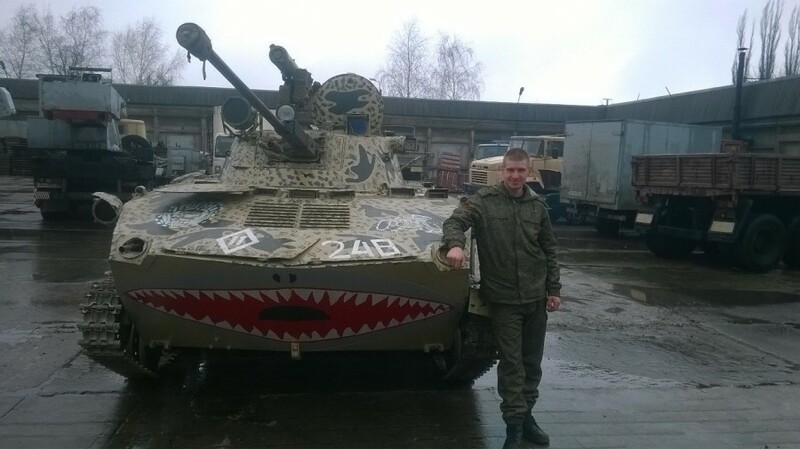 One of the new BMD-2s, serial number 275, was later captured by Ukrainian forces at Lutuhyne — near Luhansk — on Aug. 20, with documentation onboard showing it came from a company of the 76th Guards Airborne Division stationed in Pskov, Russia. The 25th Brigade fell back in the face of the onslaught. A Ukrainian paratrooper shared details of one nightmarish engagement during the retreat from Shaktarsk toward the strongpoint of Debaltseve. “August 4, it was decided to withdraw our unit. Early in the morning on [Aug. 5] we formed up in a column and set out in the direction of Debaltseve. Leading the column was a civilian car with scouts, which we had captured a few days earlierwhen we captured Debaltseve. Behind it, the remaining BMD-2 and motor vehicles, followed by artillerymen, followed by my Rheostat and Soroka [BTR-D command vehicle]. Then the BMD-1KSh communication vehicle, followed by the D-30 [122 millimeter howitzer] and the remainder of the vehicles. At a bend in the road the column fell into an ambush. A 2S9 took a direct hit. The ammunition detonated. All the crew members, as well as the battery’s deputy commander, died. The vehicle was blown to shreds. As a result, the part of the column that stood in front continued to move, while one BMD-2 and two 2S9 tried to destroy the enemy with direct fire. By October 2014, the 25th Brigade had taken such heavy losses it withdrew briefly from battle. It began receiving BTR-70s wheeled APCs and towed 122-millimeter howitzers to replace some of its missing BMDs and 2S9s. However, the lighter BMDs continued to see action. Intense battles raged into the winter of 2014-2015, centered around Ukrainian strongpoints at the Dontesk International Airport and Debaltseve, both of which fell to Russian artillery and armored assaults in 2015. Additional Ukrainian BMDs were knocked out in these engagements, including two BMDs destroyed by Russian tank fire in January 2015 at Avdiivka. Though the BMD can carry anti-tank missiles, there are no recorded instances of them knocking out enemy tanks. The Russian site Lost Armor has geotagged photographic records showing that 45 BMD vehicles and variants were disabled or destroyed from 2014 to 2016, 17 of which were rebel operated. Of course, there may be additional knocked-out vehicles that have not been recorded, and the fact that some were knocked out, captured and put back into service several times may confuse matters. Zhirukov claims that the 25th Brigade lost 44 armored vehicles, including 12 BMD-1s and 20 BMD-2s; and that the 25th Airborne suffered 134 personnel killed in action. By his count, 19 BMD-1s continue to serve with the 25th Airborne Brigade in 2017, with another 15 employed by training units, although he does not clarify the number of BMD-2s, 2S9s and BTR-Ds. Lost Armor cataloged the destruction or disabling of two rebel-operated BMD-1s, 11 to 13 BMD-2s, three BTR-D troop carriers and one 2S9 in 2014. By one accounting, this may leave the rebels with as many as 14 remaining BMD-2s, one Rheostat and nine 2S9s. The blog One Paratrooper tallies up 65 BMDs and related variants as having been lost by both sides, including 14 BMD-1s and eight 2S9s on the Ukrainian side. Due to their limited passenger capacity, most accounts suggests that the warring sides deployed their BMDs like light tanks in the early stages of the conflict, useful for overrunning road blocks and providing accurate fire support at a distance. However, as heavy tanks, artillery and siege warfare came to dominate the conflict, the thinly-armored vehicles became vulnerable death traps. The BMD crews on both sides of the conflict of Ukraine endured terrible risks and braved abundant mines, tanks and rocket-propelled grenades. Many paid a terrible price in the service of their opposing causes.